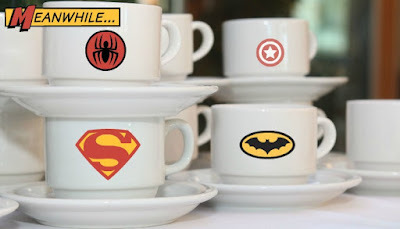 How a cup of coffee can turn you into a planet saving Superhero. The all important morning coffee… we all need it… it gives us that little boost of energy first thing and gets us in the right frame of mind to plan the day… that little bit of breathing space… to create some order and formulate our plan of action. That’s exactly what happened for me today, Friday 22nd April 2016, World Earth Day, I made my coffee and had a little think about what small difference any small business can make to save them money and save the planet. If you’ve ever watched your electricity meter when the kettle is put on to boil you’d be alarmed! If your team make drinks at different intervals throughout the day, each boiling a full kettle of water for 1 cup of coffee it is both a waste of electricity and staff time. Think about investing in an instant hot water heater or perhaps suggesting the first person in boils a full kettle and the hot water is then kept warm in a thermos flask. Alternatively only boil the amount of water you need. Stationery. Paper supplies can be a really high cost for businesses and deforestation has a huge environmental impact. Simple things like changing the default settings on your photocopiers and printers to ‘double sided printing’ can make a huge difference and encouraging your staff not to print emails unless necessary. When refurbishing your office try moving away from fluorescent strip lighting or bulb lighting to LED (Light Emitting Diode) lighting. LED lights do have higher up-front costs but last much longer and have a much lower power usage. Disposing of LEDS is safer for the environment too. Flourescent bulbs contain mercury which is toxic. Heating the office. It’s important your staff have comfortable working conditions. It aids productivity and boosts morale. In winter make sure the building is heated sufficiently but don’t leave the central heating on all day or over the weekend if nobody is going to be there. The same applies to air conditioning – don’t leave it on outside of office hours and don’t have the air conditioning on and windows open at the same time. In spring time it’s lovely to open the windows for some fresh air rather than sticking the air conditioning on! These suggestions just scratch the surface of what you can achieve… so go on… be a superhero… make yourself a coffee and see what savings you can make that help your business and save the planet.